We are so excited to partner with The Microsoft Store! Through this partnership, we can offer an ideal environment for all to learn about Microsoft Azure. The Microsoft Store Fashion Centre at Pentagon City is a vibrant retail store that sells all of the latest Microsoft products, and provides a wide range of training classes to Microsoft consumers. 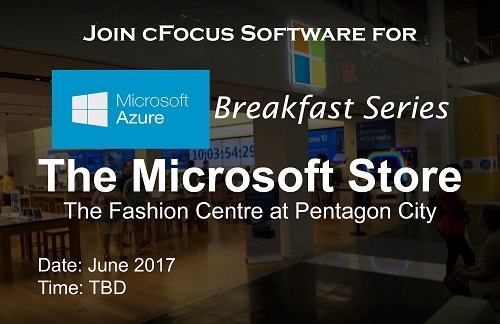 cFocus Software has partnered with the Store to offer a monthly networking and Microsoft Azure training event over breakfast. The first breakfast was held on May 18, 2017. “We are so excited to partner with The Microsoft Store!” said Mr. Jasson Walker, Jr., President & CEO of cFocus Software. “Through this partnership, we can offer an ideal environment for all to learn about Microsoft Azure,” he said.